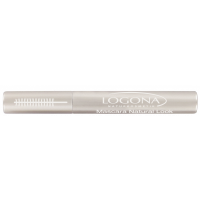 The new and improved LOGONA mascaras enhance your lashes with color, volume, and definition, while protecting them from breaking and splitting. The large, full brush coats each lash from base to tip for maximum length, thickness, separation, and rich color. Mild and non-irritating, the new LOGONA mascaras condition your lashes with premium ingredients. Application Tip: For maximum volume and expressiveness, apply mascara in several light layers, allowing each to dry briefly before the next layer.